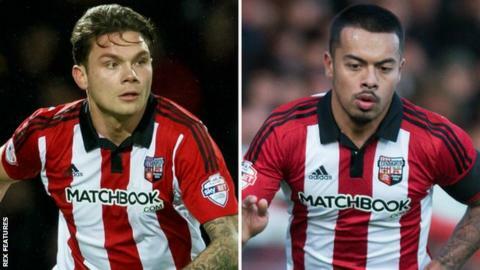 Brentford defenders Harlee Dean and Nico Yennaris have extended their contracts with the Championship club. Dean, 24, has agreed a new two-year deal which will expire in the summer of 2018, while Yennaris, 22, has extended his stay until the summer of 2019. Centre-back Dean joined the Bees from Southampton in 2011, initially on loan, and has played 184 times for the club. Yennaris, who can play at right-back or in midfield, has made 30 appearances since joining from Arsenal in 2014. "Harlee has been an integral part of the success on the playing field over the last couple of years," Bees head coach Dean Smith told the club website. "Nico has shown that he wants to further develop and is keen to establish himself within the first team."